This has frankly been one of the most talked about feature since the release of Google Chrome. The basic reason was for the first time such a feature had gained so much of a worth. But what was forgotten was that this feature had been stay put in Firefox 3 since its launch. So it was only the case that most of us hadn't realized it earlier. The very basic reason why this feature is not that noticable in Firefox because of the fact, it comes with the Bookmarks toolbar in Firefox which as such is not visible by default. So in order to use the built in feature you will have to make the Bookmarks toolbar visible. This can be done in two ways, either of which would yield the same result. Secondly you can enable it by Going to the View menu in the menubar. 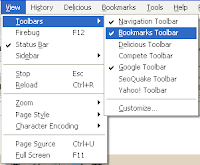 So navigate to : View > Toolbars > Bookmarks Toolbar . 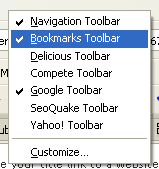 This would enable the Bookmarks toolbar in your FireFox. 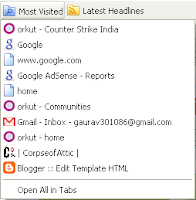 So in the Bookmarks toolbar you can see the Most Visited folder, which on clicking gives you the top 10 most visited pages, of which any one can be clicked to open it in the same tab. If you have deleted the most visited bookmark folder, then you can follow these steps to recover them. Just follow these steps at the Mozilla Support on How to Recover the Deleted Most Visited bookmark. If you wish to have the same effect as chrome in your FireFox, that new tab displays links to the most visited pages. For this feature you need to add a FireFox addon named 'Speed Dial' which can be configured to open Links to Most visited pages in new tab or new FireFox window. So If you do miss the most visited page feature of Google Chrome, you might not miss it again. Erik, I am not sure about this, but would get you know, if there is a way.